Try not to blindly accept the emerging "official story" behind the Boston Marathon bombing, and instead view it though a prism of healthy skepticism. Question the corporate media cartel's versions of events. Something is clearly amiss, so it's time to keep an open mind and pay attention. The first thing that should raise an eyebrow is the homogeneous messaging across the media cartel's broadcasting networks, news publications, and talk radio. At a minimum, it illustrates the collusion of information - reading from the same script - that exists within the corporate media, regardless of political bias. Second, the prior notification that Boston police would be conducting a controlled-explosion drill during the marathon is glaringly absent in the corporate media's coverage. 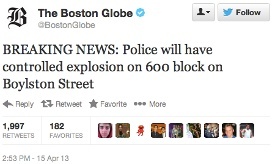 The Boston Globe tweeted specifics about the planned drill, actually naming Boylston Street in its alert mere hours before the bombs exploded at the intersection of Boylston and Exeter streets (RCReader.com/y/globetweet). Additionally, witnesses, including University of Mobile Cross-Country Coach Ali Stevenson, told reporters that people were reassured by authorities via loudspeakers that it was only a drill (RCReader.com/y/coach). Bomb-sniffing dogs and police bomb squads in full gear were in extra supply at the finish line and along the race route. Security was noticeably intensified compared with other national marathons. Also, just days before the marathon, Boston EMS announced it had a new tablet for patient-information management and would be testing it during the marathon (RCReader.com/y/tablet). This is critical information and deserves close scrutiny, but alas, it's largely missing in the corporate media's versions of events. What I question is how, if this was not a drill, did a bomb so close to the finish line escape all the bomb-sniffing dogs and the large presence of trained bomb-detecting personnel using their high-tech explosives-sensing equipment? An argument can certainly be made for the stunning ineffectiveness and/or incompetence of the security protocol taxpayers are funding at astronomical levels to no avail. The most skeptical view is that this was a false-flag setup to instill even more fear and convince Americans to abdicate even more protected rights. Maybe it was one of the more than 50 terrorists plots manufactured by our own FBI (as detailed in Mother Jones reporter Trevor Aaronson's new book The Terror Factory [RCReader.com/y/terrorism]) that got out of hand. Maybe it was the announced controlled explosion by police (!) that went very wrong. Even if it is some version of an actual terrorist act, the official story so far is glaringly suspicious by any measure, and because it involves lost lives (including a child only eight years old), Americans need to engage and start asking relevant questions that demand truthful answers this time. The time has come for the public to acknowledge and fully accept that governments engage in false-flag conduct as a justifiable part of doing business. Usually the agendas behind such extreme measures are political, and they are always designed to manipulate public opinion in government's favor. America's government is no exception. The amount of evidence supporting these extreme activities is massive and available for public consumption. Naturally, if this is a false-flag event, or a drill gone awry, it does beg the question: What is happening elsewhere that a horrific event could aid in distracting Americans from it? What legislation, appointments, executive orders, and rule-making are better done under-the-radar? Do not underestimate the benefits of deferred accountability. Finally, who will be blamed for this bombing? What stereotypical culprit or culprits will emerge as the loons who perpetrated this new horror on American soil? Whether a lone loon, government operatives, or a terrorist group, these fiends are murderers and must be correctly identified for prosecution. Of equal importance: What new constraints, intrusions, and abuses of our liberty will be invoked in the name of more security? Sadly, recent history has shown us that prosecution of criminal conduct by government employees, or people operating on their behalf, is never forthcoming. (Iran-Contra, billions of drug-cartel dollars laundered in U.S. banks, Jon Corzine and MF Global, gun-walking programs such as Fast & Furious, and the lies surrounding Benghazi come to mind.) Horribly, U.S. Attorney General Eric Holder has publicly admitted he is too afraid to prosecute banksters or financial insiders for fear it will hurt the economy. At the end of the day, no amount of government programs and policies will ultimately make us secure. We have to take personal responsibility for our safety, especially knowing that, in 2005, the U.S. Supreme Court in Castle Rock V. Gonzales affirmed that police are not responsible for protecting us from harm, only investigating crime and arresting criminals after the fact (RCReader.com/y/castlerock). Back to the current crisis. Be very careful to avoid the media cartel's attempts to demonize average citizens who disagree with the government's relentless overreach, dislike paying taxes to bail out banksters and hedge funds, disapprove of abortion, covet the protections of rights outlined in the Constitution, object to globalization and UN governance, support ending the Federal Reserve Bank's authority to control the money supply using fiat currency, etc. These are all legitimate concerns expressed by responsible, law-abiding Americans. Demonizing such folk as extreme is pure propaganda and utterly un-American. It might benefit readers to examine what is passing for extremism in the Department of Homeland Security's training lists and manuals. Evangelical Christians feature prominently now, as do military veterans, pro-lifers, alternative-media outlets such as the Reader, and any American who opposes gun control, abolishing the Constitution, undeclared wars on a credit card, unprotected borders, obstacles to additional political parties, surveillance and weaponized drones in American airspace, government control of the Internet, increased militarization of domestic police, weapons stockpiling by the Department of Homeland Security, the NSA's new data-collection center in Utah, implementation of the NDAA suspending Americans' due process, executive orders permitting kill lists ... and I'm just getting started. In a recent DHS training video, the new definition of a "paper terrorist" is anyone who files complaints and/or liens against government employees, elected or appointed, for bad acts, including violating their oaths of office.